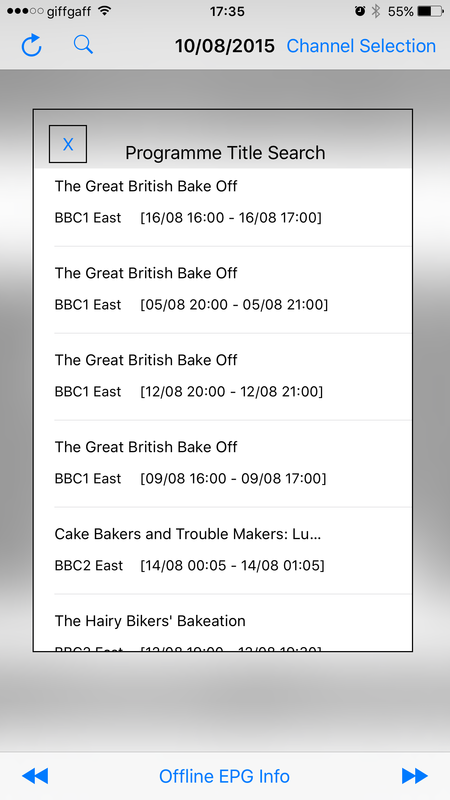 This is my third and final write-up on the development of an electronic programme guide app. As of part 2, the main scrolling view with the programme details, scaled to length, are displayed. Next up I wanted to have the ability to display programme details. This seemed like it was going to be pretty straightforward: when building the per-programme view, I included a button, which is transparent, and has the same dimensions as the view itself. The first problem is associating the programme details with the button itself. There is plenty of discussion on StackOverflow about how to do this in the least offensive way. I went with a category and then object association. This allowed me to set the GUID as a property for the button. That ‘strong’ means that everything in the view is held in memory. It has to be said that the app is very heavy on memory – as a direct consequence of that view object retention. It routinely occupies 63Mb in my testing. It’s all a bit clunky, but it works. I imagine that this sort of interface plumbing actually happens quite a lot behind the scenes. That said, I may have missed a trick to do it in an easier way. Having experimented with this, it appears that predicateWithFormat has to have the actual string passed to it, as opposed to a variable containing the string. Which I have to say strikes me as a little odd. The functional upshot of this is that I couldn’t support a variable number of search terms. I support up to three, and construct a separate predicateWithFormat for each possibility. One final problem that I couldn’t find a fix for was implementing a UITableView’s delegates in a class that I pass the view into as a parameter. I couldn’t find a way of getting the cellForRowAtIndexPath delegate method to be called. The conclusion I came to with this was that it was setting the delegate to self, when ‘self’ was the custom object, rather than the view. It was largely a cosmetic thing [I’ve noticed that for complicated apps, I have a tendency to pile way to much code into the main viewController] so it was easily solved. The other buttons that I haven’t talked about explicitly are an ability to switch between days, and initiate a download of EPG data – but which are pretty straightforward. What’s still either ugly or hasn’t been fully implemented is the download progress indicator, and also the what’s-on-now quick look on the Apple Watch, as I want to have a mess around with something completely unrelated to this app: the motion detection capability. I did add a quick fix to ‘justify’ the right hand side of the ‘table’ of programmes. Formerly they were falling off the contentView. I simply check if the rightmost width of the cell is going to be greater than the width of the contentView. If so, I set it to be the same as the width. So that’s it. I have a pretty serviceable EPG app, which I use myself over the ad-funded variant I had before, which I guess is a fair indicator of utility. Main lesson learned: not knowing what those property attributes meant tripped me up really badly!